Hello Henrietta is the true story of a red-tailed hawk who flew into the gym of the Holy Guardian Angels Regional Elementary School in Berks County, Pennsylvania. On school picture day, Henrietta arrived unannounced through an open door in the gym. She perched on the rafters, watching the children and faculty with great curiosity. For the next three days she lived in the school and resisted all efforts to free her. The children devised ways to lure the hawk from her new home. They tried baiting her with caged animals, drawing her interest with sponges, and even tempting her with meatballs. Nothing seemed to work. In the end, the hawk left on her own terms. The children were sad to see her go, but they were glad for her visit. Henrietta still returns to the school from time to time. She sits in a tree or perches atop the church steeple, keeping watch over the children and the school she briefly called home. 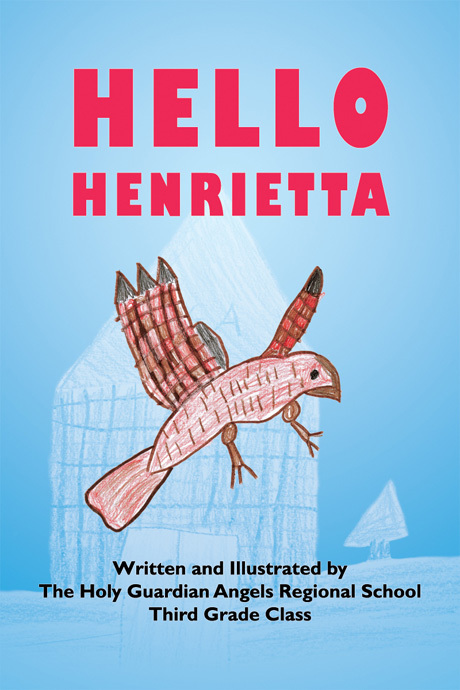 Hello Henrietta was illustrated by the third graders at The Holy Guardian Angels Regional School. This book is a fundraiser for the Holy Guardian Angels Regional School, and can be ordered by contacting the school.